Following a 3-1 loss to the Blue Jackets on Sunday, the Lightning face a-three-games to none deficit in their First Round series heading into Game 4 on Tuesday. The Bolts were encouraged by their finish to Game 3 despite the loss and are hoping to build momentum off that in Tuesday’s match-up. Tampa Bay out shot Columbus 17-9 over the final period in Game 3. The Lightning are searching for their first victory in the best-of-seven First Round series against Columbus tonight at Nationwide Arena…Tampa Bay has faced an 0-3 hole in a playoff series only once in franchise history, that coming in a 2014 Eastern Conference Quarterfinal series against Montreal, the Lightning losing the series in four games…Four teams in NHL history have rallied from an 0-3 deficit to win a best-of-seven series, the last time coming in the 2014 Western Conference Quarterfinals when the Los Angeles Kings overcame a 0-3 deficit to defeat the San Jose Sharks before going on to win the Stanley Cup Final over the New York Rangers…The Bolts have lost three in a row to Columbus after coming into the First Round playoff series having won six straight over the Blue Jackets…Mikhail Sergachev saw his eight-game point streak against Columbus snapped in Game 3 but has recorded a point in eight of his nine career games vs. CBJ (3-9–12) and scored his first career NHL goals against the Blue Jackets, netting two on Oct. 19, 2017 at Columbus…Tyler Johnson has tallied five assists in six games this season against Columbus…Andrei Vasilevskiy has more career shutouts (3) vs. Columbus than he does against any other NHL team (Vasilevskiy is looking for his first career playoff shutout). 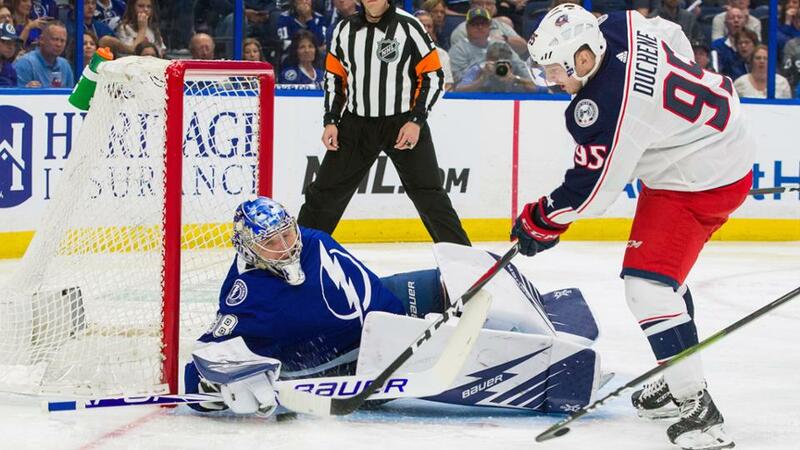 Tampa Bay is 13-10 all-time in Game 4’s and has won six-consecutive Game 4’s, the Lightning’s last Game 4 loss coming in the 2015 Stanley Cup Final at Chicago (a 2-1 defeat)…The Lightning are 10-3 all-time in Game 4’s on the road and have won five-straight Game 4’s away from Amalie Arena…The Bolts are 7-4 in Game 4’s under head coach Jon Cooper…Tampa Bay owns an all-time play-off record of 73-63, including a 37-28 mark in road playoff games…The Lightning have won five of their last seven and 10 of their last 1 5 road playoff games…The Lightning are 36-30 in the post-season under head coach Jon Cooper…The Bolts enter Game 4 with 1,447 combined games of playoff experience on the roster; Dan Girardi has the most playoff experience (142 games) overall on the Lightning while Victor Hedman has played in the most playoff games (84) with Tampa Bay…The Lightning won the first Presidents’ Trophy in franchise history in 2018-19, requiring the second-fewest games all-time in the NHL to clinch the trophy (73 games), and finished as the top team in the Eastern Conference (and Atlantic Division) for the second-consecutive season…Tampa Bay’s 62 regular season wins were tied with the 1995-96 Detroit Red Wings for the most in NHL history…The Lightning’s 128 regular season points were the fourth most all-time in the League…The Bolts topped the NHL and set a franchise record for goals (319) during the regular season and finished with the most goals in the League since 1995-96 (Pittsburgh – 362; Colorado – 326; Detroit – 325). Join us at Sparkman Wharf in Channelside for the official Lightning Watch Party. The party starts at 6 p.m. with live music, beer specials, food, giveaways & more! Gear up for the playoffs with this Go Bolts Playoff T-Shirt. Available exclusively in store and at TampaBaySports.com.